Rope bridges can be intimidating for many people, especially when they’re very high up. Add in a poor maintenance factor, and using them then becomes something only the brave or foolhardy would attempt. Crossing this canopy walkway can be scary for three reasons – height, length, and width. It’s over 160 feet high, and the 7 hanging bridges in all make up a length that exceeds a thousand feet. While the narrow nature of the walking area of the bridge can also increase anxiety levels. Spectacular views of the park do mean though, that many will think to cross the bridge will have proven to have been worthwhile. 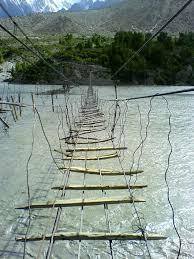 No maintenance issues with this rope bridge, but height is a different matter. Nearly a hundred feet above the rocks below, the Carrick-a-Rede bridge is used, mostly by tourists, to go back and forth from the mainland to the minuscule island of Carrick-a-Rede. This is one bridge, where it could be said that the great views make the nervous walk across worth it. Some 330 feet below this bridge is Triftsee Lake, while the bridge is also surrounded by the stunning scenery of the Swiss Alps. Similarly to the Trift Bridge, the Taman Negara Bridge offers terrific views. However, it is over 500 metres in length, and enjoying the views of being above the trees may not be enough compensation for those treading on eggshells all the way across! A bridge that will seem like an eternity to get across if you’re scared of heights. But it is safer than it looks, and donkeys and cows travel across it along with humans. With holes at regular intervals this isn’t a bridge that inspires confidence, and while crossing it you can see the Kotmale River flowing by in the gaps in the wood. That said, this bridge would be even scarier to walk across if height were a bigger issue. So poorly maintained this bridge almost looks impossible to walk over in parts. With uneven bits of wood tilted upwards, and even no rope to hang onto in some areas, one wonders how many people actually still use it. This entry was posted in Bridges and tagged bridges, dangerous rope bridges, perilous rope bridges, rope bridge, rope bridges. Bookmark the permalink.